A crew member of Ms. Barbra Streisand's says it best in the Blu-ray "Behind the Scenes" featurette "The People" when he illustrates that since-- frankly there is no bigger artist in the entire world-- the recordings and performances of Streisand should be documented and collected for future generations. I couldn't agree more and just one look at the diverse crowd gathered for this critically lauded 2006 Fort Lauderdale, Florida concert recently released on DVD and Blu-ray seems to be all the proof we need that regardless of age, gender, and background-- everyone considers a Streisand concert to be a show-stopping must-see. And, not taking this trust and responsiblity lightly-- she delivers on all fronts in this '06 North American tour that was kicked off essentially to raise funds for her philanthropic efforts that have turned the former award-winning singer and actress into a humanitarian over the last few decades. From children in the audience that were brought along to see Streisand in the hopes that they'll be able to learn a thing about what true musical quality really sounds like to devoted fans who help welcome her with a standing ovation at the beginning of the show before she even sings one note to the red-carpet level stars and politicians gathered (including former President and Senator Clinton, Robert De Niro, Sarah Jessica Parker, Tom Hanks, Sting, Ben Stiller, Nancy Pelosi, and her The Way We Were director, the late great Sydney Pollack among others)-- this sold-out show filled with an elegant production design is fittingly divided into two Broadway style acts. Opening with her beloved original Broadway Overture from her Oscar winning Funny Girl and weaving her way through not just a string of her beloved hits including "The Way We Were" and "People," but also works that she hadn't performed in several decades not to mention some of the earliest songs she'd ever sung or written-- (including her first tune composed at the age of 22 with the French "Ma Premiere Chanson")-- Streisand also performs work with the international group Il Divo. Likewise, she works in a playful narrative involving a Q&A session from cards completed by audience members. Additionally, delving into her extraordinary repertoire and catalogue of classic works, Streisand's astounding ability to find new meaning in standards like "Come Rain Or Come Shine," "My Man," and "Happy Days Are Here Again," is an unparalleled quality that only benefits with age and life experience along with her joyful takes on South Pacific's Nellie Forbush number "A Cockeyed Optimist" from the Rodgers and Hammerstein classic as well as the heartrending "Smile" which was recorded after the singer lost her treasured dog. Never failing to put her most regal foot forward by changing costumes a few times in a mostly dark, elegant and understated wardrobe with unique accents that play second fiddle to her best accessory-- namely, that dynamite voice as she saunters down a long elaborate catwalk of sorts to give her a more intimate interplay with the audience amidst vases of roses, Streisand's concert captured here in phenomenal clarity and sound gives you the best seat in the house. Furthermore, it proves once and for all why filming concerts by legends like Streisand is a vital and integral part of our American history. While the Blu-ray's poorly designed menu is a hindrance as the gold titles that just barely brighten when selected will have you squinting to figure out just what it is you've landed on with your remote-- if you are able to discover the extras after you take in both acts of the two hour plus concert, you'll definitely want to explore the special features. Whether she's pointing out the need for women to continue to change the status-quo and politely saying "no thank you" when a fan yells "Barbra for President" before singing "The Woman in the Moon," in one of five bonus songs (including two more with Il Divo) or explaining that it's never too late to try again when she tackles a song she last performed at the age of eighteen ("Nobody's Heart Belongs to Me") during which she'd forgotten the words, she never fails to astound. Likewise, we get to see another side of the performer via those who know her best in featurettes that take a look at her work as a musical artist and interpreter of music such as the way one interviewee points out she never sings the same song the same way. Similarly, in a particularly fascinating extra-- we learn more about her charitable foundation and the dedication and commitment Streisand has in assisting nearly eight hundred organizations of various sizes. 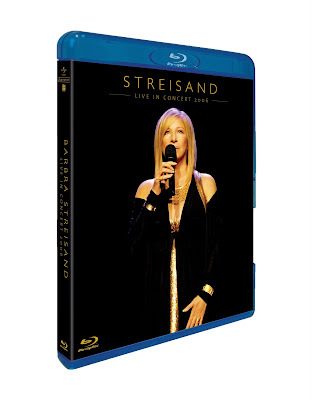 A stunning concert that delivers on a level way beyond that of "casual fan," with the luminous production value and performance quality-- Streisand: Live in Concert 2006 is a highly recommended Blu-ray that was also released on the same day as its DVD companion that spans three discs and incorporates a concert from more than a decade earlier. A perfect gift for Mother's Day and an ideal way to "see a concert" during this unthinkable economic recession-- my only hope is that this is the first of more Blu-ray concerts to come from this American icon who's proven time and time again she's so much more than just one of our favorite Oscar winning "funny" girls. 2. "Starting Here, Starting Now"
4. "The Way We Were"
8. "Come Rain or Come Shine"
10. "The Music That Makes Me Dance"
15. "Carefully Taught"/"Children Will Listen"
17. "What Are You Doing The Rest Of Your Life?" 19. "Happy Days Are Here Again"
20. "(Have I Stayed) Too Long At The Fair?" 21. "The Time Of Your Life"